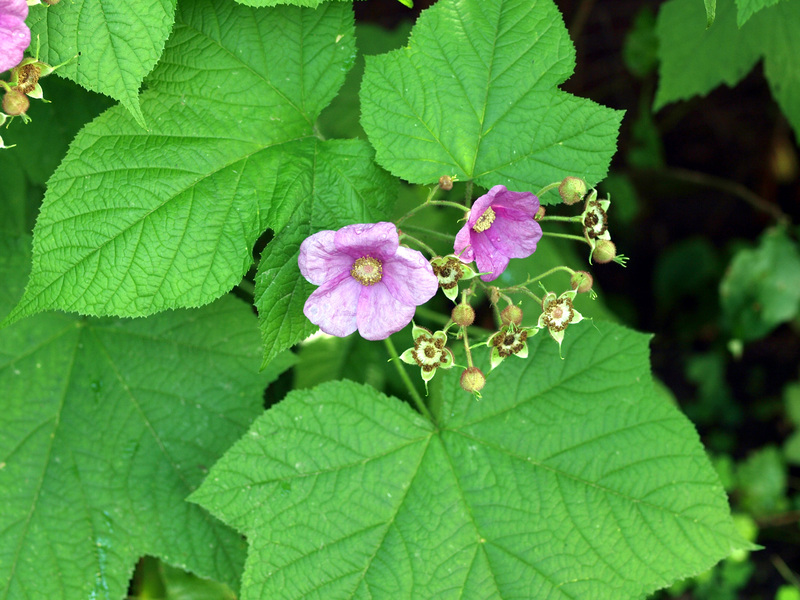 Rubus odoratus is a shrub to 2 m tall, stems dark-glandular hairy, widely branched, thornless. Leaves alternate, broad, to 20 cm wide, with 3-5 triangular lobes, irregularly toothed. Flowers pink-purple to 6 cm wide, sepals densely purple-glandular-hairy; blooms June-Aug.
Fruit red, 1 cm wide, dryish, bland, individual fruitlets often falling separately; ripens July-Sept.
Habitat: Moist open woods, part shade, rocky woodland edges. Often planted also. Soil pH 5-6. Tolerant of shade. Moderately tolerant of drought, soil compaction. Intolerant of flooding (Hightshoe 1988).